For investors who decide to strategically allocate to factor premiums, the question of how to most efficiently construct portfolios that provide exposures to these factors is critical. Is it better to create a portfolio using individual, single-factor components (thinking of them as “building blocks”)? Or, is it better to build a multi-factor portfolio from the security level (where scoring or ranking systems are used to select securities)? It should be intuitive that the latter approach, using multi-factor funds rather than single-factor funds (what is referred to as a bottom-up approach), is superior. One reason is that if you use the component approach, you will have one factor fund buying a stock (or group of stocks) while another factor fund will be selling the same stock (or group of stocks). For example, if a stock (or an entire sector) is falling in price, it might drop to a level that would cause a value fund to buy it, while a momentum fund would be selling the very same security. Investors would thus be paying two management fees and also incurring trading costs twice, without having any impact on the portfolio’s overall holdings. The unnecessary turnover could also lead to the realization of capital gains. Jennifer Bender and Taie Wang, authors of the 2016 study “Can the Whole Be More Than the Sum of the Parts? Bottom-Up versus Top-Down Multifactor Portfolio Construction,” which appeared in a 2016 Special QES Issue of The Journal of Portfolio Management (link here), examined which of the two approaches is more efficient. The authors observed that the bottom-up (multi-factor) approach would seem to be a better one because the portfolio weight of each security will depend on how well it ranks on multiple factors simultaneously, while the approach combining single-factor portfolios may miss the effects of cross-sectional interaction between factors at the security level. The study used the equity factors of value, size, quality, low volatility and momentum, from which the authors built global portfolios from developed markets. Bender and Wang found that the bottom-up portfolio returns were higher than any of the underlying individual component factor returns and higher than the combinations. Additionally, the volatility of the bottom-up portfolio was significantly lower. 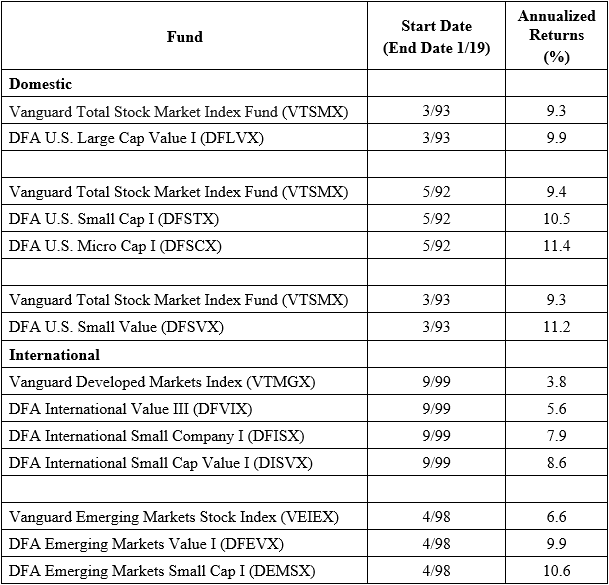 For example, over the period from January 1993 through March 2015, the combination portfolio not only earned a lower return than the bottom-up portfolio (11.1 percent versus 12.1 percent), but it also exhibited higher volatility (an annual standard deviation of 14.9 percent versus 13.8 percent). The following table from their study summarizes Bender and Wang’s results. The latest support for the multi-factor approach comes from David Blitz and Milan Vidojevic, authors of the July 2018 study “The Characteristics of Factor Investing.” They built a characteristics-based multi-factor expected return model to qualitatively and quantitatively describe the returns of factor-based portfolios. This model enabled them to estimate the expected returns of each stock in the universe, at each point in time, and further to aggregate these expectations on a factor-portfolio level. Their data sample covers the period from June 1963 through December of 2017. Single-factor portfolios, which are strategies that invest in stocks that score highly on one particular factor, are generally suboptimal because they ignore the possibility that these stocks may be unattractive from the perspective of other factors. Negative contributions from other factors cause these strategies to have a substantial weight in stocks with negative expected and ex-post realized market-relative returns. For example, a generic value strategy invests, on average, about 20 percent in stocks that are expected to underperform. While these stocks have attractive value characteristics, which contribute positively to their expected returns, their other factor characteristics are unattractive, and the negative contributions from these factors offset the positive contribution from value. Other generic factors display similar patterns. The return of generic factor strategies can be enhanced signiﬁcantly by simply removing stocks that have lower expected returns than the market, based on their overall factor proﬁle. Some stocks have such poor factor characteristics that their expected returns end up being lower than returns on Treasuries. By simply removing those stocks from the market portfolio ex-ante, the realized market return increases by 16 percent, in relative terms. Here’s the applicable table from their study. Return differences between factor portfolios in the small-cap and large-cap space, and between equally weighted and value-weighted factor portfolios, can also be explained by their model. The market portfolio itself suffers from a signiﬁcant return drag caused by stocks with unattractive factor characteristics. The market portfolio is invested, on average, about 9 percent in stocks that have an expected return lower than the expected return on 10-year Treasury bonds. Removing such stocks from the market portfolio increases the equity risk premium by about 16 percent, in relative terms. Solely targeting the proﬁtability premium and the size premium results in suboptimal results unless they take other factors, and, crucially, the price paid per unit of fundamental (book) value, into account. …a thorough understanding of how factor characteristics drive portfolio returns is the key towards successful factor investing. Both the logic and the evidence presented demonstrate that the way factor-based portfolios are constructed matters a great deal. Efficient portfolios are ones that are both designed from the bottom up and exclude stocks that have negative loadings on other factors to the extent they create a substantial drag on returns. Thus, returns of even single-factor portfolios can be improved by screening out stocks with negative premiums, once all factor exposures are considered. Of course, the issue is not entirely black and white, and there is room for debate depending on how the analysis is conducted. For example, Alpha Architect has a research piece that examines more concentrated characteristics-focused portfolios and finds that combining single-factor approaches may be more effective than multi-factor approaches. One hypothesis for this empirical result is the potential expected return benefits of more concentrated single-factor exposure overwhelm any potential benefits of considering cross-sectional interaction effects. Another difference in its analysis is the use of EBIT/TEV as the value metric versus the traditional book-to-market version of the value factor. Long story short, if the design of your portfolio is factor-based, one needs to understand the construction rules used by the funds in it and do a deep dive into the underlying process. Different approaches can achieve different goals, and investors should confirm that the process they are investing in aligns with the goals they seek to achieve. 1. ↑ A history of factor models is available here. 2. ↑ Good summaries of factor replication research are here and here.